Size: Width: 130 in.x Height: 37 in. Symphony Speed: The right stuff for speed freaks! The Speed series lives up to its name with blazing fast speed and smooth control. 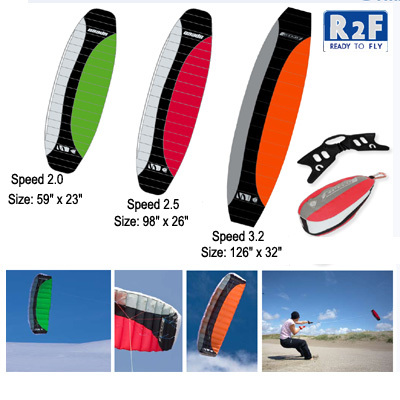 A higher aspect ratio enables theses kites to fly much faster than regular Symphonys for more thrilling power. Carefully engineered with sewn Dyneema bridles for lower parasitic drag and built with the same meticulous high quality standards as our top-end Powerkites. The Symphony Speed packs small for everyday travel, because you never know when the wind is going to blow.